Because both my husband and my daughter suffer from allergies, the level of air quality in our home is something my family takes seriously. We currently use air filtration systems in both bedrooms so that we all can sleep soundly throughout the night without awaking to a clogged head or itchy, watering eyes. Although these systems work great, they are rather expensive to maintain. Himalayan Salt Shop offers a much more natural and inexpensive solution to keeping your home's air clean and fresh. They offer a myriad of natural shaped salt lamps and candle holders which are both functional and extremely beautiful. Keep reading to learn more! I reviewed the Himalayan Salt Lamp (9-11 lb.) from Himalayan Salt Shop, which retails for $54.99 but is currently on sale for $34.99. Receive 20% OFF your entire order with coupon code "dec2011"
These salt lamps are made of natural Himalayan crystal salt mined from underground salt mines in the foothills of the Himalayan Mountains. This crystal salt is hundreds of millions of years old and, as a result, has special properties and a high mineral content, which when heated, causes the salt to emit negative ions. These negative ions bond with the pollutants in the air (positive ions) and neutralize them, causing them to become heavier and fall to the ground thus removing them from the air circulation. I had the opportunity to review the 9-11 lb. 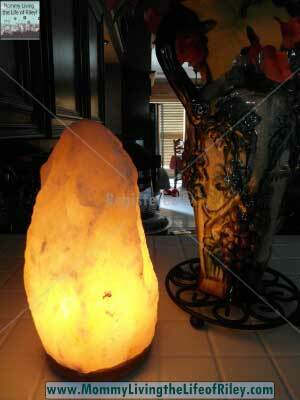 size natural shape salt lamp from Himalayan Salt Shop and was right away pleased by its overall natural beauty. This gorgeous piece of solid salt is mounted on a small wooden base and comes complete with a power cord with on/off switch and a 15-watt light bulb. Simply screw the small light bulb into the power cord, pinch the two metal clips together and slide the light fixture inside the base of the lamp itself. 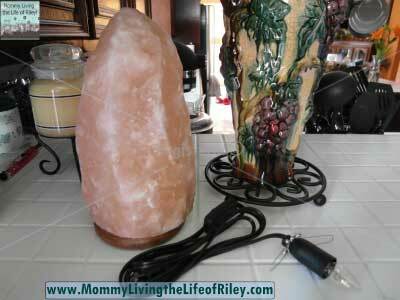 Within minutes, your salt lamp can begin heating up and emitting those air cleaning negative ions. I was immediately taken aback once the salt lamp was turned on, for it emitted such a beautiful, warm and glowing light. I would definitely like to have several of these to use throughout my home for the light they gave off was much more powerful and cozy than a typical candle's flame. The best part is knowing that these gorgeous salt lamps are also helping to clean the air in my home and bring relief to my husband and daughter's allergies. If you are concerned about the air quality in your home and are searching for a more natural and inexpensive way to do something about it, then I highly recommend trying a Himalayan Salt Lamp from the Himalayan Salt Shop. They have a myriad of styles and sizes perfect for any room in your house. Of course, I also highly recommend them to anyone who loves the warm glow of a candle, but would like a safer and longer-lasting alternative to a dangerous open flame. I actually prefer the beautiful light from the Himalayan Salt Lamp over a traditional candle and plan to purchase many more of these for various areas of my home! Disclosure: I received the Himalayan Salt Lamp (9-11 lb.) from Himalayan Salt Shop in order to facilitate my review. No other compensation was received. This product review is based on my own personal experiences with this item and is completely honest and objective.